There be pirates in the vast void of space! Does not the poet say: “Beware the strangeness of the stranger. Unknown things bring unknown danger?” The noble ship Procrustes was silent as a ghost. Warships can be silent if they are slow; only their missiles need speed. And so it was silently, slowly, that the Procrustes approached the stranger’s cold vessel. 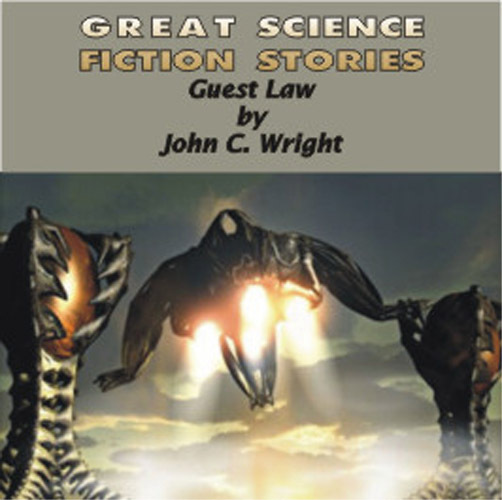 Perhaps it is a short story like “Guest Law” that best showcases John C. Wright’s considerable talent. Told from the point of view of a lowly engineer on a pirate ship, Wright uses their encounter with a broken-down ship to paint an entire universe. We learn of the adaptations that the pirates made to themselves to adapt to life in space, We learn that there is a universally accepted “guest law” to which all must adhere. We learn why people left Earth to live in space and why. 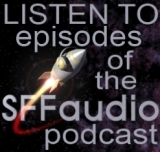 We learn the pirates’ usual method of subjugation of those they conquer. One would think that might be enough, but against that background, the pirates’ method of dealing with the other ship’s captain reveals a great deal about honor and humanity that is timeless no matter what the setting. Wright’s use of language is almost poetic and is nicely showcased by Tom Dheere’s narration. The only problem I encountered is Dheere’s choice of different accents for different characters. Some seemed to be British or Irish but the choices seemed entirely random to me unless the purpose was to point out high or low class. If so, perhaps a different technique could have been used as I found it almost jarring when the various accents would come up in the story. However, this is not enough of a problem to stop you from listening and greatly enjoying the story itself.